You are hereHome Is enough being done to protect ICC witnesses? Is enough being done to protect ICC witnesses? 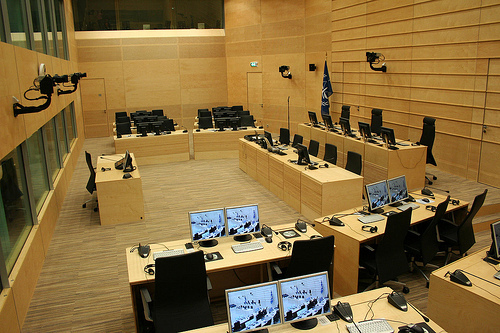 As with most legal systems, witnesses are essential to determining truth at the ICC. Yet witness support and protection can be challenging, as they can be victims of intimidation or bribery or may have suffered from trauma. The Rome Statute obliges the ICC to guarantee their rights and safety. The Registry’s Victims and Witnesses Unit (VWU) is tasked with ensuring just that. The VWU must take all appropriate measures to protect the safety, physical and psychological well-being of witnesses appearing before the Court. It provides protective measures, security arrangements, counseling and other appropriate assistance. VWU experts are specialized in witness protection and security, humanitarian and criminal law, psychology, gender and cultural diversity and dealing with children – and in particular traumatized children. What kind of measures can be taken to protect witnesses? Protective measures are essential to guaranteeing the security and cooperation of threatened or traumatized witnesses, helping witnesses testify freely and truthfully. The ICC’s protection system is primarily built upon best practices when interacting with victims and witnesses. This work is often aimed at concealing a witness’ interaction with the Court from their community and from the general public. There are several different types of protection measures – inside and outside the courtroom. Operational protective measures can be implemented where witnesses reside; for example extracting witnesses to a safe location should they be targeted or in fear of being targeted. Other operational protective measures include educating witnesses on the importance of confidentiality and cover stories. Procedural protective measures are used within the courtroom, often consisting of face/voice distortion or the use of pseudonyms. Judges can grant other measures within the Courtroom, for example to protect witnesses from the public and the media and ensure their privacy. The Rome Statute also provides that the Court can conduct any part of its proceedings in private sessions or closed sessions, or allow the presentation of evidence by electronic or other means. Other practical measures include removing the name or any identifying information of a witness from the public records, as well as prohibiting the prosecution, the defense or any other participant in the proceedings from disclosing identifying information to a third party. Separate special measures can be ordered by the Court for traumatized witnesses, a child, an elderly person or a victim of sexual violence. These can include facilitating the testimony of witnesses by allowing a psychologist or family member to be present while the witness gives testimony or by using a curtain to shield the witness from direct eye contact with the accused. A last resort protective measure is entry into the Court’s Protection Programme, through which the witness and his or her close relatives are relocated away from the source of a threat. This is an effective method of protection, but due to the immense burden on the relocated persons, relocation remains a measure of last resort and absolute necessity. What measures can be taken to support witnesses? In order to ensure their psychological well-being, dignity and privacy, when required, the VWU provides support services and assistance to witnesses and victims who appear before the Court, along with persons accompanying them. These support measures include the provision of basic information about the Court and the Courtroom proceedings, psychosocial support, crisis intervention, and access to medical care when needed. This is a process where the courtroom and trial procedure is shown to the witnesses in advance of their testimony. Many witnesses will have never been in a courtroom before and may find it daunting, which could impact on their well-being, as well as their testimony. The VWU support team also offers assistance during the travel of victims and witnesses to the location of the hearings and provides services to them around the clock. Special measures, including in-court assistance, can be recommended by the VWU to a Chamber to facilitate the testimony of vulnerable witnesses, such as adapting the courtroom to the needs of vulnerable persons (e.g. through the prevention of eye contact between the witness and the suspect, use of video-link, etc) and recommending the adaption of the manner of questioning to the needs of the person. The services provided by the VWU are monitored regularly and tailored to meet the specific needs of victims and witnesses, taking into account their cultural, religious and social requirements. Particular attention is given to vulnerable groups, such as victims of sexual or gender violence, children, the elderly and persons with disabilities. The VWU support services promote gender-sensitive measures to facilitate the testimony of victims of sexual violence. Psychological support measures are taken not only during the hearings with the presence of a psychologist, but also in the field. Psychological support for witnesses aims to avoid further stress for witnesses who may be vulnerable due to the fact of taking part in the ICC’s processes and to prevent revictimization or relapse into trauma. While witness protection is primarily the responsibility of the ICC and the prosecutor, the Rome Statute system depends heavily on the cooperation of ICC member states to enter into voluntary agreements to relocate witnesses. The ICC has no police force and is located far from many of the situations in which it investigates. As with many other aspects of the Rome Statue system, government cooperation is essential to making international justice work. Relocation agreements, while a last resort, have become a key part of the ICC’s protection program. It is crucial that more states enter into them. The very effectiveness of the ICC’s proceedings is at stake. The Coalition for the ICC and its cooperation team has for many years urged ICC member states to enter into a range of voluntary agreements with the Court. Read more about how the international community best support the need to protect witnesses in international atrocity crime trials (International Criminal Justice Today, American Bar Association). Have your say – is enough being done to protect ICC witnesses? Sign up here for weekly mail updates.